AS Pest Control provide an efficient, affordable and professional Bee control service in Mansfield. Available 24/7 we offer a quick and reliable service to conveniently remove the Bee problem. Where bees nest depends on the species, you will often see bees entering a hole in the ground or in a wall or roof. Honey bee nests will have thousands of bees and swarm around the entrance. They commonly nest in chimneys but will use any cavity. Bumble bees are the largest and usually nest in the ground or places like compost heaps or lofts. Masonry or mining bees will be seen entering many holes in the ground or in mortar. 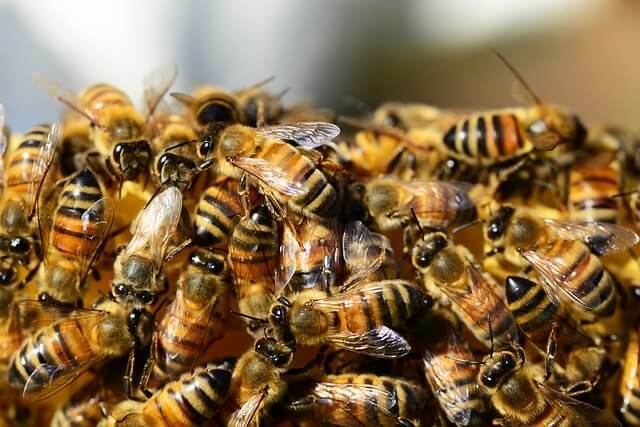 Contact AS Pest Control and we can provide a free on-site bee nest control quotation and advise on the best way to deter bees from your property in the future. Bees are not as aggressive as wasps but will sting if they think the nest is threatened. Honey bees will not hesitate to sting and can become dangerous due to the large numbers. Bees can sometimes be removed and re-located depending on the ease of access. Treatment of a bee nest is sometimes the only solution. Never block a nest entrance until after professional treatment has been done, this can be very dangerous. Following treatment care must be taken to prevent contamination of other colonies. Once a nest is dead other bees may raid honey stores left behind and could carry chemicals used back to their own nest. To prevent this happening the honey is either removed or the access points sealed. AS Pest Control provide Bee Control in Mansfield from only £48. Treatment of the bee nest will depend on the location and species of bees. Honey bee nests in a chimney or cavity can require two technicians to safely carry out the work. All affected areas will be treated with insecticide. After treatment has been completed bees may remain in a hyperactive state for a few hours but will usually completely cease within 7 warm days (cold or wet days can prolong activity). Honey bee swarms should die within 24 hours. AS Pest Control provide a local, affordable bee control solution for residential and commercial customers in Mansfield, Nottingham, Derby, Chesterfield, Worksop and surrounding areas.